Executives from Milestone, Airbus and Aramco commemorate award of five H145 helicopters. 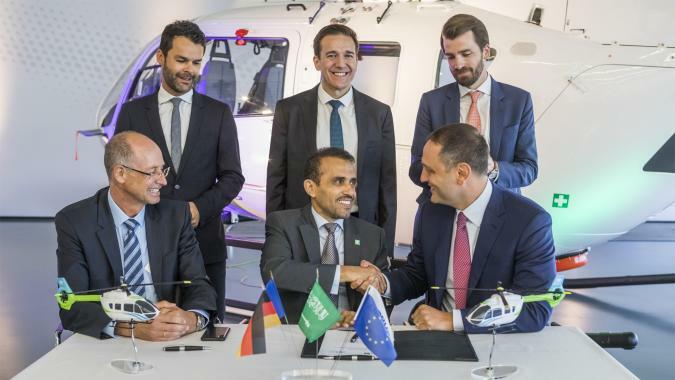 Milestone Aviation Group Limited (“Milestone”), a GECAS company and the global leader in helicopter leasing, and Airbus Helicopters announced they will provide five H145s to Aramco Overseas Company, a subsidiary of Saudi Aramco, a fully integrated, global petroleum and chemicals enterprise. The five aircraft are sourced from Milestone’s orderbook with Airbus and are expected to be delivered to Aramco over the next twelve months. This latest lease commitment of five light-twin aircraft will be in addition to the 24 medium aircraft Milestone currently has contracted on lease to Aramco.